The New City In Cebu! SM Seaside City Cebu Guide for Real Estate, Shopping, Restaurants and Nightlife.With the fourth largest mall in the world! Where to go and what to do in SM Seaside City Cebu. SM Seaside City located in Cebu, Philippines is a 30-hectare mixed use development project of SM Prime which involves the construction of a Php4.5 billion shopping mall with a gross floor area of 241,600 square meters. The mall is expected to open in the third quarter of 2014. This new mall, aptly called SM Seaside City Cebu is one of the first developments in the master plan of SM Properties for their 304,100 sq. m. site, the new mall is now 40% complete! The new SM Mall, which stretches from the northern part of the SRP to the sea. Designed by Arquitectonica, an international architecture, interior design and planning firm from Miami, Florida, the grand, first-of-its-kind urban development at the SRP will dramatically change the landscape of the city with its nautilus-inspired design of expanding, concentric arcs from a central multipurpose space. A large church – a sleek, modern all-white structure nestled among lush foliage – will be the first to be built and completed in the SM SRP complex. Hotels, a conference and convention center, residential buildings and community facilities will follow, and will be designed to span out from the SM Seaside City Cebu mall, which will be located at the center of the entire development. The mall will be interconnected with these other structures through elevated walkways. With a lot area of 93, 570 sq. m. and a gross floor area of 291,043 sq. m., SM Seaside City Cebu will be a 4-level, circular-shaped, world-class retail mall with multiple anchors, including a two-story SM Department Store and SM Hypermart, a 5-theater Cineplex and IMAX Theater, an 18-lane SM Bowling and Amusement Center, and a food court flanking an ice skating rink. In addition, the mall will have over 800 food and retail shops, including international brands. Retail shops will occupy the outer arc of the mall on the ground floor. This area will include a furniture zone as well as a fashion boulevard to showcase the talent of Cebu’s many local designers. Numerous new wining and dining outlets will face an inner circular garden, increasing in number as shoppers proceed to the higher floors. On the third floor, these outlets will have verandas facing the garden below while the fourth floor will have restaurants and bars on the outer circuit of the circle with verandas on the north side of the mall looking out to the sea. The mall will also have a covered event area for concerts and shows at the fourth floor as well as a roof garden with ponds and trees, as well as restaurants to enjoy the beauty of the greens from. Keeping with the nautilus-inspired theme, the mall’s car park will be incorporated into the structure, helping to define the semi-circular volume of the building. The mall’s layout induces traffic to flow inwards and upwards. The second-level garden has a drop-off area for private vehicles whereas public vehicles will have their own transport interchange at the ground level with different areas dedicated to taxis, public utilities and buses. The retail and food outlets at the ground level will be easily accessible to the riding public while service and delivery bays for tenants and SM anchors are set aside at strategic areas. An Iconic Viewing Tower will be an attraction in itself, offering sensational panoramic views of the entire city of Cebu while serving as a new landmark for the city. SM Seaside City Cebu will be one of the first establishments to create an address in this district of metro Cebu, and will pave the way for development in the area. HYPERMARKET- SM Hypermarket is a full-fledged business entity within the SM Group of Companies. For one, it has been successful in creating the convenience of having a first-rate indoor wet market as well as a food and general merchandise store in all of the Hypermarkets. The concept behind the creation of a new retail format – which is what is now known as a “hypermarket retail format” – is to combine the features of a supermarket with those of a department store. The principal aim of this venture is to provide the consumer with a one-stop shop where most shopping needs will be satisfied all in one go. The Hypermarket in SM Seaside City Cebu will have 12,410 sq.m floor area. DEPARTMENT STORE The 20,389 sq.m 2-level SM Department Store in SM Seaside City Cebu will be the home of the latest trends in fashion and accessories – from Ladies, Men, Boys and Girls Teens, Children, Infants, Shoes & Bags, Accessories, and Beauty & Wellness. RETAIL SHOPS/RESTAURANTS/JUNIOR ANCHORSOver 800 food & non-food tenants including international brands. 5 CINEMAS SM Cinema is proud to be the largest cinema exhibitor in the country today, currently operating over 200 cinemas in more than 36 SM Supermalls nationwide – and still growing! IMAX THEATRE With over 500-seating capacity, IMAX Theater is equipped with the most advance digital theater system. It is also equipped with the latest revolutionary IMAX digital projection system projects crystal clear, larger than life 2D & 3D images and delivers laser-aligned digital sound. IMAX makes you feel the full emotional impact of the visionary creators’ dream and creates powerful experiences by enhancing every image, sound, and dimension. BOWLING CENTRE It will have an 18-lane SM Bowling Center. ICE SKATING RINK It can accommodate both recreational and competitive figure skating. The Ice Skating Rink will occupy 1,966 sq.m in floor area. ROOF GARDEN Similar to SM North Edsa, the roof garden is 23,443 sq.m elevated park with ponds, trees, and restaurants. The park provides the much needed greenery not only for the mall but for the city. COVERED EVENT AREA Will be situated at the 4th level, the Event Area is a perfect venue for performances, shows, and exhibits. THEATER 1,020 seating capacity perfect for stage plays, concerts, and other performances. COVERED PARKING89, 366 sq.m with 2,234 slots and With 2nd floor, 2nd mezzanine, 3rd floor and 3rd floor mezzanine. PUBLIC TRANSPORT INTERCHANGEFor taxis and jeepneys. ICONIC VIEWING TOWER100-meter viewing tower (this is still a proposal, no specific details available). For Interested buyers, we will send you the intent thru email, please provide us your email address. THE CUBEIt will be similar to the Globe in SM Mall of Asia (this is still a proposal, no specific details available) and will be made of LED. MANILA, Philippines - Condominium builder SM Development Corp. (SMDC) will spend P71 billion to complete existing projects and enter new property ventures in the next three years, top company officials said yesterday. “In the next three years, SMDC will spend P71 billion to drive its expansion activities,” said newly-appointed SMDC president and chief operating officer Jeffrey Lim. The residential arm of the country’s richest man Henry Sy has a considerable landbank in Metro Manila good for the next five years, he said. “For the year 2013, SMDC will spend approximately P20 billion in capital expenditures – P13 billion for project development and P7 billion for landbanking,” Lim said. 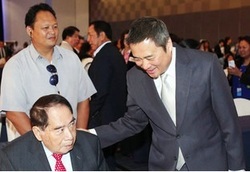 It will be followed by P26 billion and P25 billion spending in 2014 and 2015, respectively.“For 2013, we plan to launch four new projects and expand three existing developments in Metro Manila,” said SMDC vice-chairman and CEO Henry Sy Jr. Sy said SMDC will continue to focus largely in Metro Manila in the medium term given robust demand in the area. The property developer will launch 13,000 units this year, almost double the 7,000 units in 2012. Real estate revenues rose four percent to P5.9 billion. Lim said of its 173 hectares landbank, 69 hectares are located in Metro Manila, with the remaining in Davao and Cebu. Sy said the substantial landbank is enough to support more developments in the next five years. Sy said. Sy said SMDC is still studying the market in China, which can be tapped given the successful business model of the condominium builder. SMDC’s board of directors also declared yesterday a cash dividend of 5.3 centavos per share for stockholders as of May 24. This is payable on June 20. As of end-2012, SMDC had 15 ongoing residential condominium projects all over Metro Manila, with the exception of Wind Residences in Tagaytay.